Let's catch up on a trip I enjoyed two weeks ago in Chicago. Unlike last year, I was mentally prepared for the size and bustle of the city, and walked confidently to the Art Institute of Chicago. I didn't get the chance to visit it last year, and the time I was there before that, we didn't allot enough time for all the wonderful Impressionist and modern art. So it was my primary goal this time to see those. Only it turned out that those works were largely unavailable because part of them were on loan elsewhere (sharing is good) and part were in storage in preparation of opening their new building dedicated only to modern art (fair enough, makes sense). I was still a little disappointed, but made due with several wonderful Georgia O'Keeffes (we share a birthday! and I didn't realize until a few years back that she did a lot more than that red poppy; I love her landscapes and more abstract pieces) and others. The next morning, I set off on the Metra to the Chicago Botanic Garden, where I had arranged to meet gardengirl (who wrote about our day here). (I'll digress briefly to say I love mass transit and enjoy riding both the El and Metra in Chicago.) I had forgotten that the Chicago Botanic Garden does not charge admission (I get into many gardens for free with reciprocal membership through my local garden, but it's still nice for it to be free!). I liked Linda right away. She's lovely and funny and knows a ton about plants, and I enjoyed our time together. I just wish we lived closer so I could bug her more often we could get together more easily. The fountain near the entrance provides a hearty welcome. 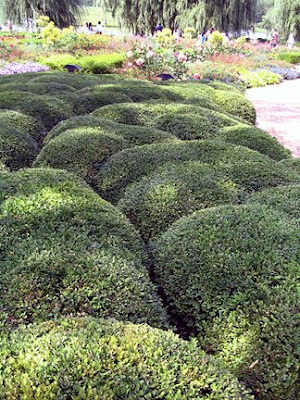 I'm not usually a fan of geometrically trimmed bushes, but thought this curvy, wavy trim of boxwood was refreshing. It gives the sense of motion. Bananas! 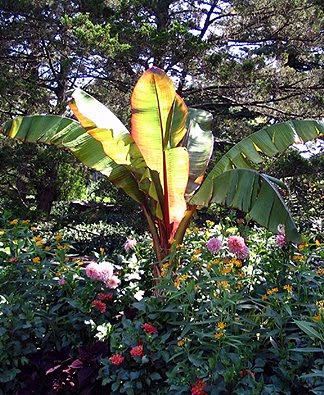 I just love the way the light is filtering through the gorgeous banana leaves, which always remind me of canna leaves. 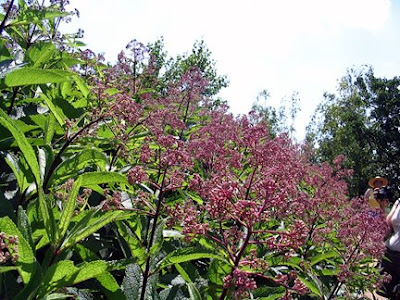 The Joe Pye weed in the native plant garden was striking. I'm happy to report that it has finally take off in my own garden, after several years of modesty. 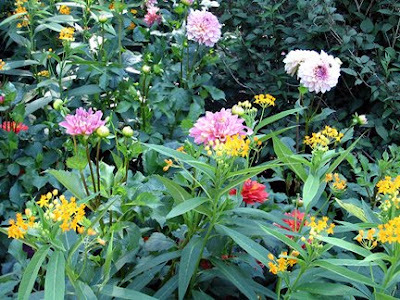 I've always enjoyed a garden of many colors (it's not willy-nilly, it's polychromatic!). Here are some colors I would not think would work together, but they do. Nature likes lots of color combinations, and so do I! 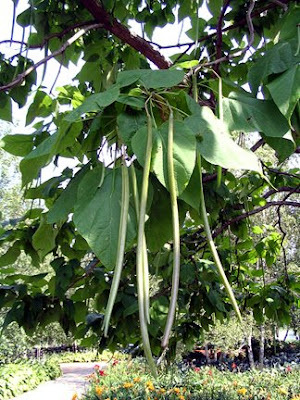 I love the pods on this catalpa tree! 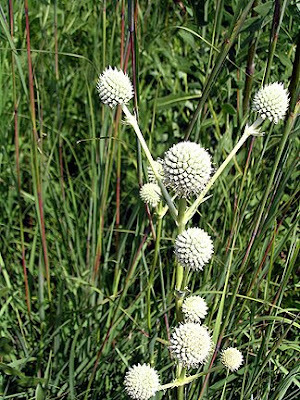 Isn't the flower of the tall cup plant cute?! And indoors, a local group was having a succulent sale. There were some pretty unusual-looking cactuses, as well as this plant which Linda thought looked like Tiddlywinks game pieces! 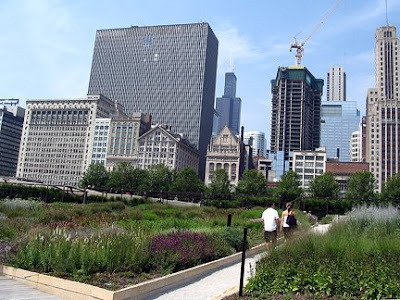 The next day, I visited, and got a master gardener-led tour of, the Lurie Garden at Millennium Park. It's an oasis in the city. Isn't the swaying purple love grass, and the city skyline in the background, beautiful? 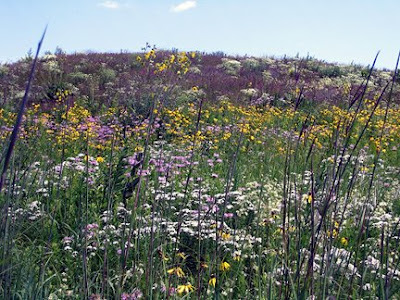 For more photos of the Lurie Garden, read my Mlive blog entry. I also walked to Buckingham Fountain, whose center spray slowly rises higher and higher, which I didn't realize until way after I took this photo. I really enjoy Chicago and recommend it for a weekend getaway or full vacation! Click for more photos of the Chicago Botanic Garden, as well as Garfield Park Conservatory and Chicago in general. What a lovely Botanic Garden. That last shot of the fountain is fantastic. 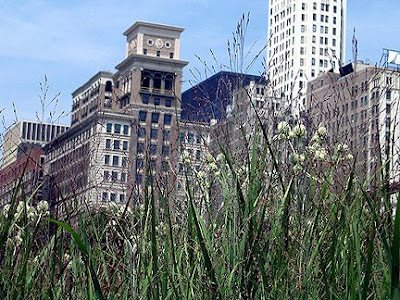 I have heard the Gardens in Chicago are great and have always wanted to go. Your post just makes me want to all the more. Rose and I are planning some day getaways this fall and hope to make this one of our trips. Thanks so much for sharing. And how great to get to meet a fellow blogger! Such a lovely post Monica! It would be cool to live closer. I really enjoyed getting to know you and enjoyed your company. Hopefully we'll have more chances ahead to get together. 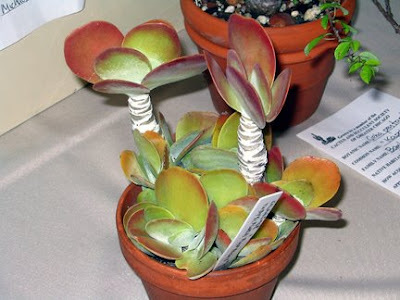 I'd forgotten about the Tiddlywinks plant - I'm glad you got a picture. It's so cute! 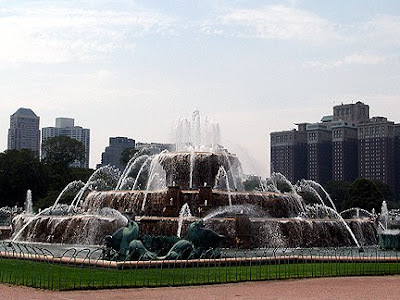 Isn't Buckingham Fountain just gorgeous! I'm glad you made it there and got that great shot. It's beautiful at night too, when it's all lit up. It's one of my favorite Chicago landmarks. that seems like such an inviting place. I just LOVE the Joe Pye weed! Mine is starting to take off too but this stand is gorgeous! Sounds like a wonderful weekend for you, Monica. 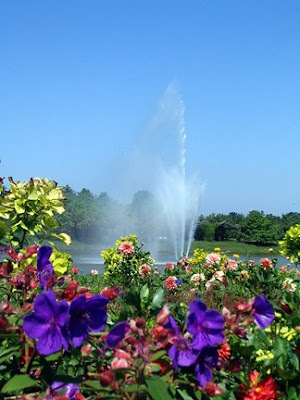 The Chicago Botanic Garden is on my wish list of places to visit; in fact, Beckie at dragonflycorner and I have been trying to find a time to drive up for a visit there. Linda's and your posts have done a great job of promoting this destination. Was fuer ein schoener Garten! Kein Wunder, dass du so schoene Bilder machen hast koennen:) Wahrscheinlich kann man dort tagelang sein ohne alles gesehen zu haben. Great photos. 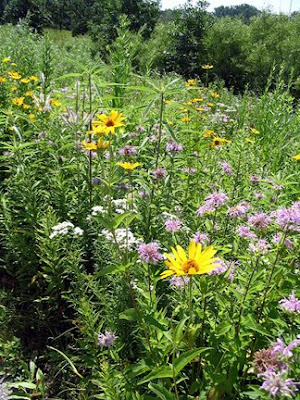 The prairie planting is one of my very favorites--and the walled English garden. I enjoyed your garden tour! That first image is fantastic!! The blue blue sky!! Wow! 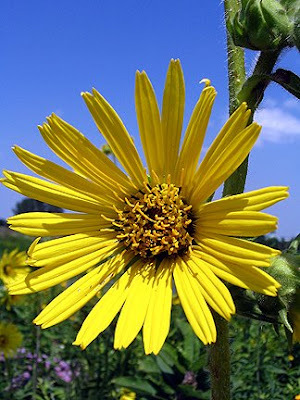 Amazing flower garden photos! Liebe Monica,da hast Du wundervolle Bilder in Chicago eingefangen. Besonders interessant sind für mich die Präriepflanzen, besonders gut gelungen ist es Dir das Licht in der Banane auf das Foto zu bannen. Es ist interessant, wir sind alle unterwegs, um Bilder aus anderen Gärten zu machen. Bei mir sind jetzt einige Impressionen der England-Gartenreise zu sehen.